Heart Valves, Digital Levels and Happy Holidays. My new workbench uses shelving units and laminated countertops. I used deckboards to help support the countertops and some boards between them and the basement walls. The boards create some more overhang at the front (toe kick) and bridge a gap I had to leave in the back because of a perimeter drainage channel. I tried leveling the countertops with wood shims but it didn’t go well. So I removed one of the countertops and started leveling the boards with paper from old catalogs and magazines (that blue stuff is masking tape). I finally realized my Harbor Freight digital level wasn’t accurate. Read the article to find out why you shouldn’t buy one. The worry level is pretty high at my house right now because my 30-year old stepdaughter is getting a heart valve replaced tomorrow. We knew she had a “minor” and somewhat common mitral valve defect but she didn’t have any problems with it until just a couple of weeks ago. We hope it goes well because we have two young grandchildren who need a healthy mom. There’s also another reason why I haven’t gotten much work done in my workshop or added much to MachinistBlog or MachinistVideos lately. 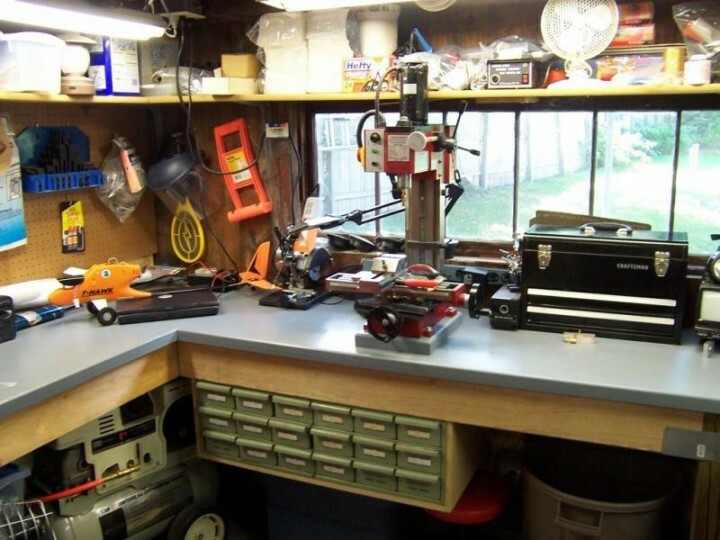 We’re having some major remodeling done and our contractor has finally finished taking over my garage workshop with his tools and materials. 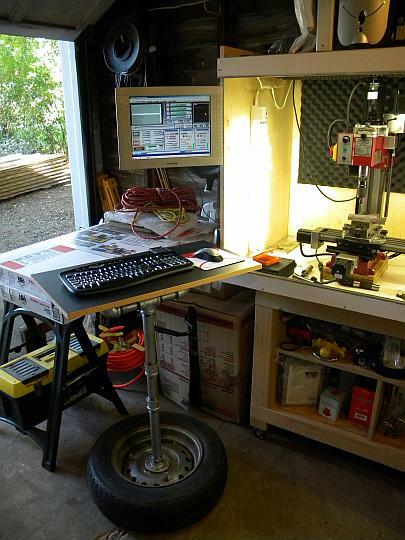 As a result I haven’t had room out there for awhile to work on my CNC router. So I’ve been concentrating on getting my new “winter” workshop in our basement finished. I have only one major task left before I can start using it. That’s to install a couple of 10-foot long laminated countertops that are mitered to join in a corner. My contractor said that to get a good joint the two pieces have to be perfectly level and I’ve been having a lot of problems getting them that way. 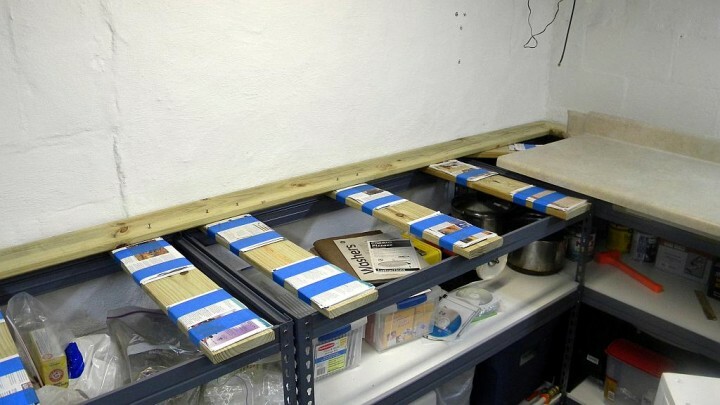 The countertops are on heavy-duty shelving units that can also be assembled as workbenches. There’s a small variation in their height and they’re sitting on a basement floor that’s not very level. To make a long story short I have to do a lot of leveling over a 20-foot distance and I wasted hours of work before I realized my digital level wasn’t accurate any more. I bought it at Harbor Freight because it was inexpensive, it had much greater resolution than a standard construction level and it had a built-in laser that I thought might be useful. I checked and it was very accurate when it was new. But it’s out of warranty now and it can’t be easily recalibrated like many other digital levels. You can typically place them on a fairly level surface, press the recalibrate button, turn the level exactly 180 degrees on the same spot and press the button again. They can then determine true level. The Harbor Freight digital level can’t do that and it has to be recalibrated by a “qualified technician.” I wasted another couple of hours unsuccessful searching the net and trying button combinations to see if I could find a way to calibrate it myself. So do not buy the Harbor Freight 24-inch digital level model 93884! I then switched to using my 8-inch Starrett machinist level on top of a much longer construction level. It’s extremely accurate and so sensitive you can easily see the difference in height caused by a very thin piece of paper. They cost about $120, so I was heartbroken when I managed to drop it a few inches and ruin it by cracking its vial. iPod Touch to the Rescue? So now my plan is to use my iPod Touch. It has a couple of digital level apps on it that are very fast and sensitive. But it’s not long enough and the back of its case is a little rounded. So I’m going to attach it to my construction level with double-sided tape and if necessary, bed the edges in Play-Doh if it needs more support. Then I’m going to calibrate it for true level using the method I described earlier. I’ll probably use the Clinometer that comes with AppBox Pro, a $1.99 collection of useful apps that I like because it includes the best tip calculator I’ve ever found. I just have to find (make?) some time to finish the job. If you’re a regular reader you probably know that I’ve been unusually busy with my job, family and yard work. Things have finally begun slowing down and I’m getting caught up. But to be honest I’m tired and a little burnt-out. I’ve also got a bunch of relatives and good friends who are going to be in town visiting next week. So I may take some time to relax and goof-off if things go well with my daughter. I want to wish you all Happy Holidays, Merry Christmas, Happy Hanukkah, Joyous Kwanzaa, Happy Festivus and a Happy New Year. (Yes, I do try to be PC – Polite and Considerate to all).